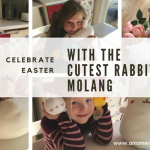 The weather was so miserable over the last few days so we were not been able to get out a lot this last weekend, so we decided to do an early Easter Egg Hunt at home. As soon as we suggested the idea to the girls, they were very excited with the idea. Of course, who would say NO to chocolates! Nobody, right? We were kindly sent a big box of chocolates from Cadbury which helped us to organise the most fun Easter Egg Hunt. They have a great selection of chocolates and packs, especially for Easter. 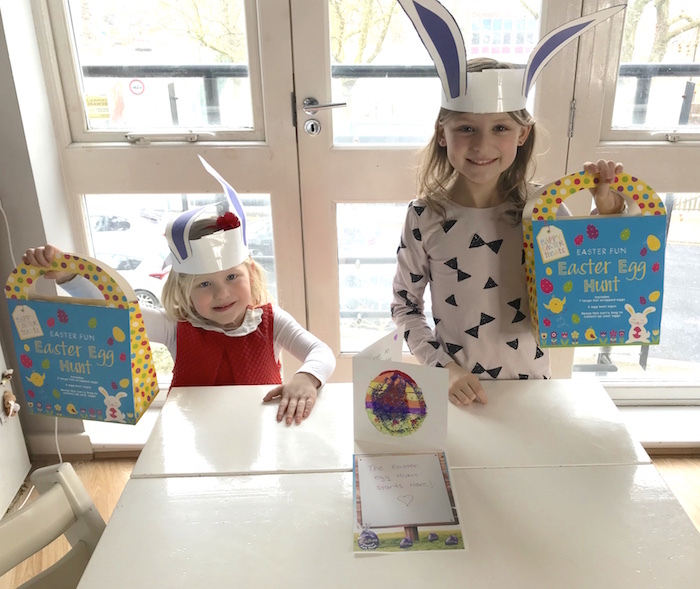 They have also put together a guide for activities to entertain our little ones during Easter as well as a guide with lots of fun resources to set up a fantastic Easter Egg Hunt such as signs, clues, bunny ears, etc. We printed and cut out most of the templates provided and they were very useful to us. 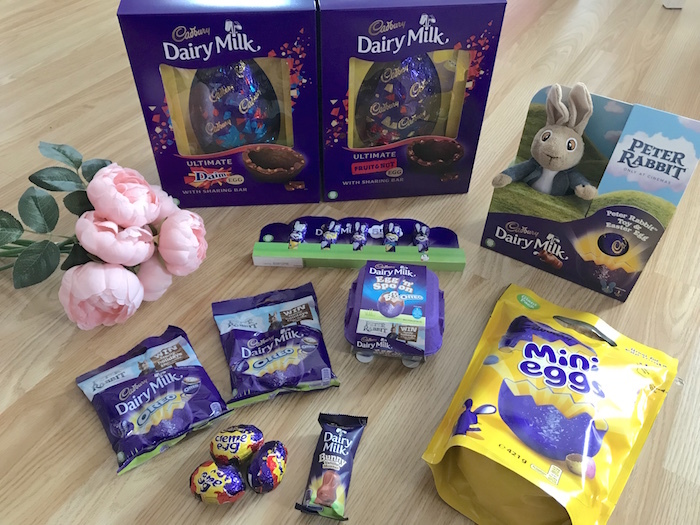 Cadbury is a firm favourite with families across the UK, with brand new products suitable for all ages and for sharing amongst the family over Easter weekend. 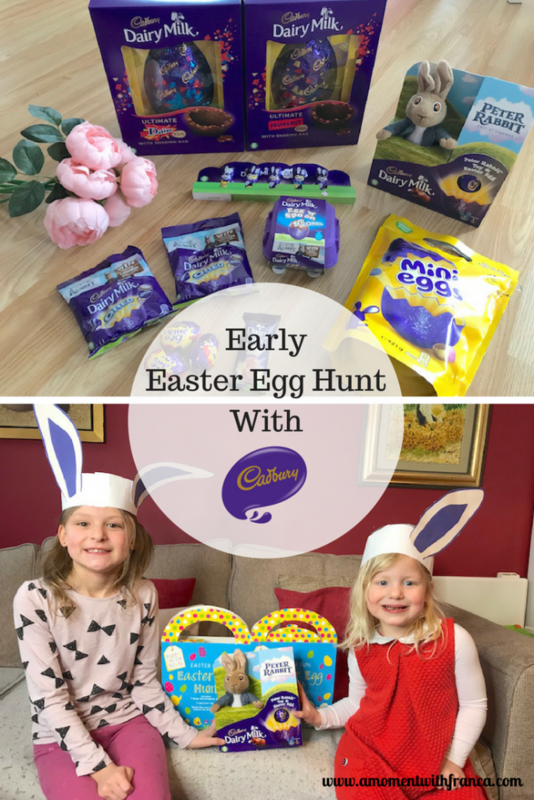 The Cadbury 2018 range offers families egg-citing new products alongside all-time Cadbury favourites that make it easier than ever to create your own magical Cadbury Easter Egg Hunt for your family and friends. You can visit the CADBURY WEBSITE to find all the details. If you want to get all your Cadbury Egg fix in one place, how about this? 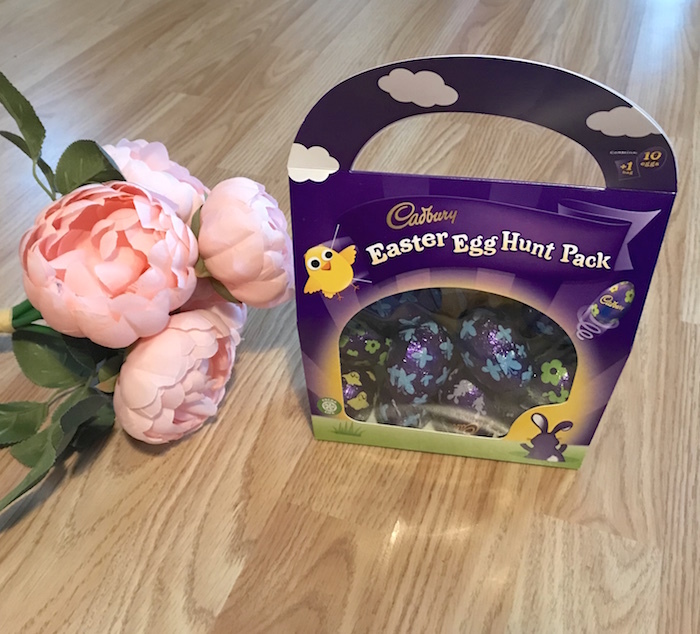 This convenient pack makes organising an Easter Egg Hunt easier than ever before! 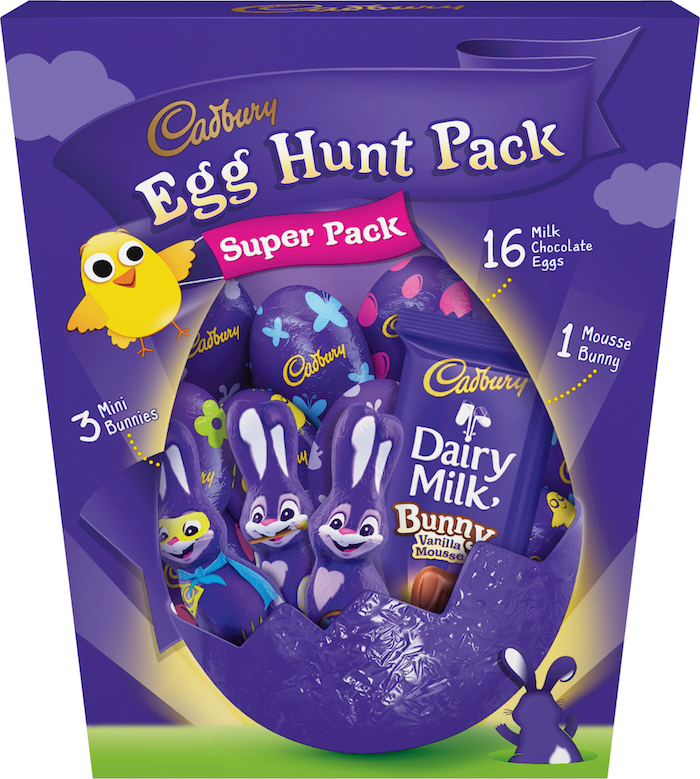 Inside you’ll discover a range of Cadbury chocolate treats such as Cadbury Dairy Milk hollow eggs and Cadbury Dairy Milk bunnies to hide along your hunt as well as Cadbury Mini Eggs that could be given as a prize. A perfect people pleaser, the Cadbury sharing bags are back with four tempting varieties including Cadbury Creme Egg, Cadbury Dairy Milk Daim, Cadbury Dairy Milk Oreo and Cadbury Dairy Milk. These delightful mini-sized eggs make the ideal treat to look for on a fun Easter egg hunt. They are small enough to tuck away but the vibrant colours make them easy enough to spot so they won’t get left undiscovered. We used all the materials provided by Cadbury to set up our Easter Egg Hunt. We also used Tale Of The Great Bunny as inspiration for doing this. 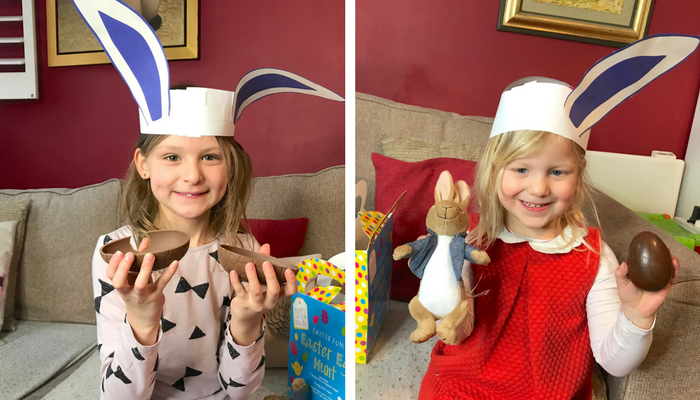 Cadbury has teamed up with singer-songwriter and mum of two, Frankie Bridge (The Saturdays), to recreate the Tale Of The Great Bunny. It will be her debut storybook. The original book was first released by Cadbury 20 years ago! 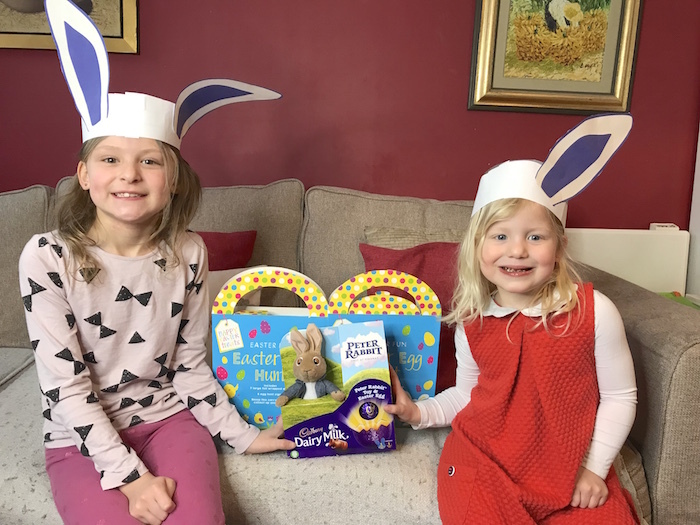 This refreshed tale brings to life the magic of Easter and tells the story of the generous Cadbury Easter Bunny, who is on a mission to surprise and delight families across the UK. 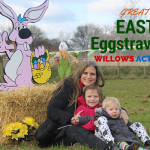 It showcases the great lengths they go to create the most magical Easter Egg Hunts! 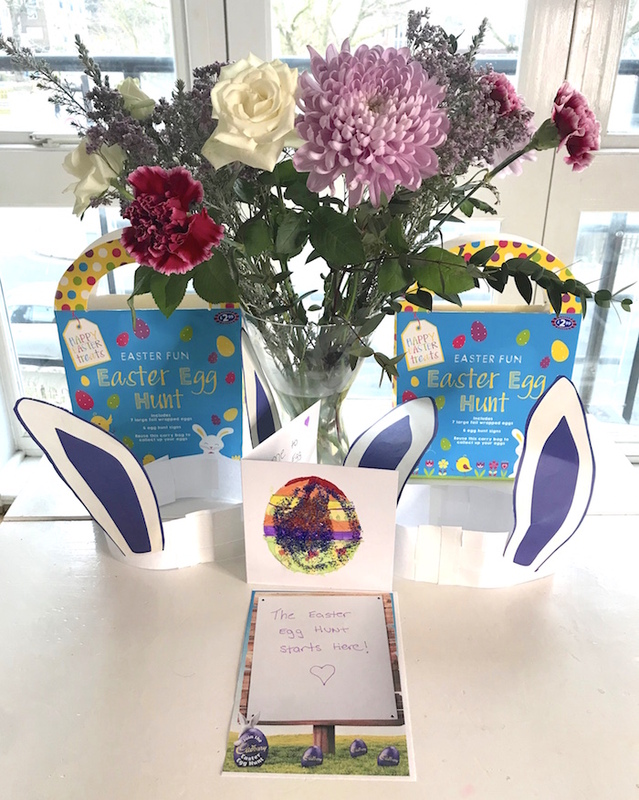 The story follows siblings Jack and Molly as they discover a series of mysterious clues and embark on an enchanting Easter Egg Hunt alongside their parents, Tom and Sarah.You can download your free copy of the Tale Of The Great Bunny HERE and get some inspiration for your own Cadbury Easter Egg Hunt! 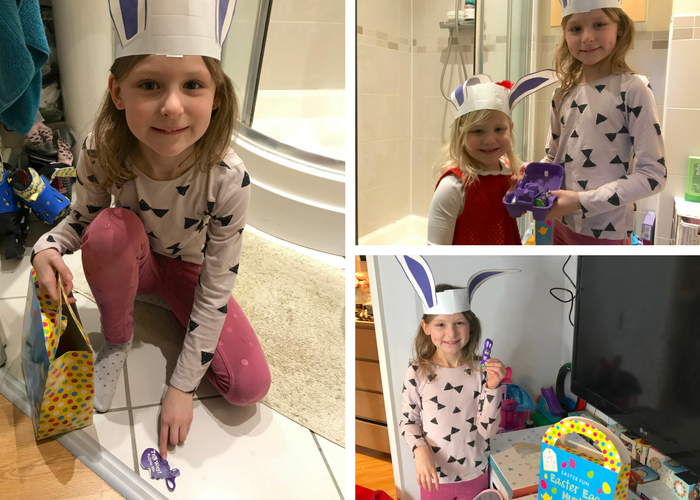 We prepared all the clues and signs provided from the Cadbury website as well as the bunny ears for each girl. We got a generic Easter basket for each so then the girls were able to place all the eggs they found in them. 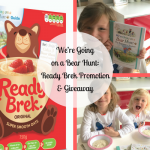 You could also prepare a basket using cereal boxes and follow the instructions from the Cadbury website activity guide. As soon as it was all set up and ready for the hunt, my girls were so excited and ready to do it. 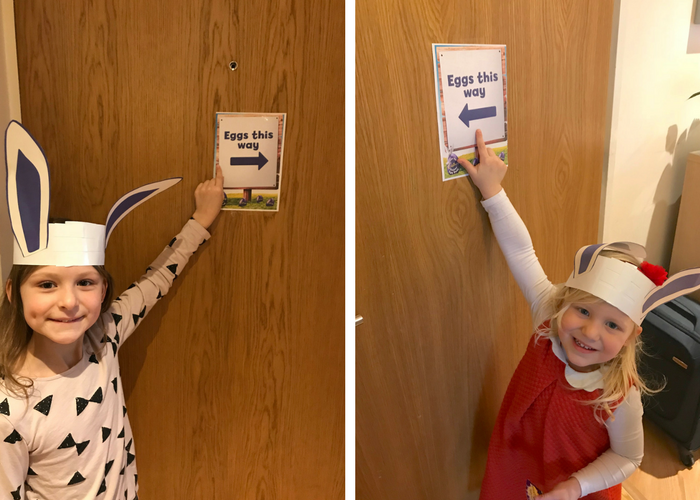 They put their bunny ears on, grabbed their egg hunt baskets and followed the signs and clues. This made the whole hunt better and easier to follow the trail. They got so many eggs between them both! We decided that at the end, the girl that gets the most eggs would win the main prize. Funnily, they both found the same amount of eggs (15 each) so they decided to share the prize! They got a lovely Peter Rabbit soft toy with a big Cadbury chocolate egg. They were both delighted. It was so much fun doing this hunt and it was perfect to do on a snowy Sunday afternoon. It kept the girls happy and excited. We enjoyed so much doing this Easter Egg Hunt as a family! They love Cadbury chocolates so it was a fantastic activity to do! There’s a whole range of cracking treats in the Cadbury Easter 2018 range that are perfect for doing your own Easter Egg Hunts. 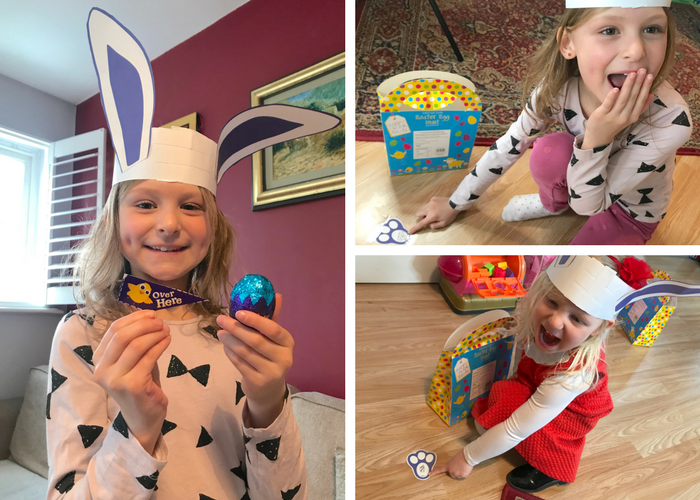 We really enjoyed the Cadbury Mini Filled Easter Egg Sharing Bags. 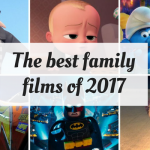 The whole family had so much fun hunting them down! 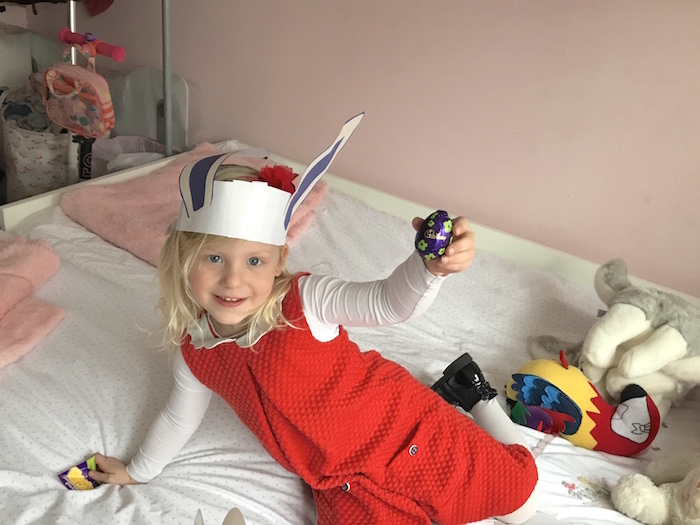 The Cadbury Easter Egg Hunts National Trust are also back for 2018 and there are over 300 hunts to choose from across England, Wales, Scotland and Northern Ireland, guaranteeing a fun-filled Easter for everyone. To discover the nearest hunt to you, visit cadbury.co.uk/Easter. 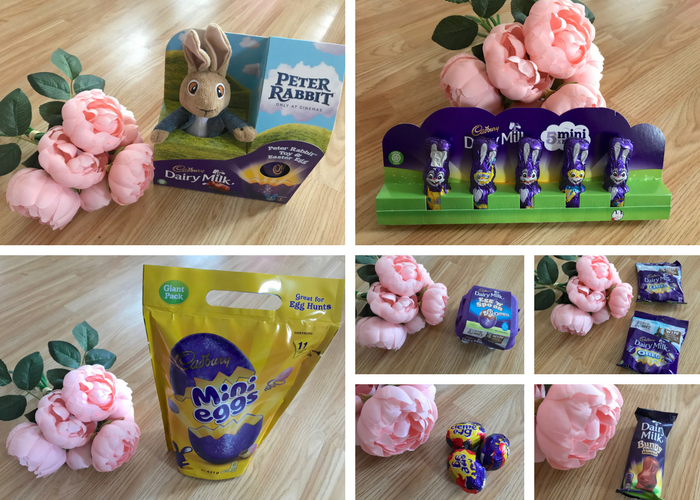 Are you planning to organise an Easter Egg Hunt this year? 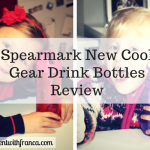 Do you like setting them up for your little ones? Where do you get inspiration from? 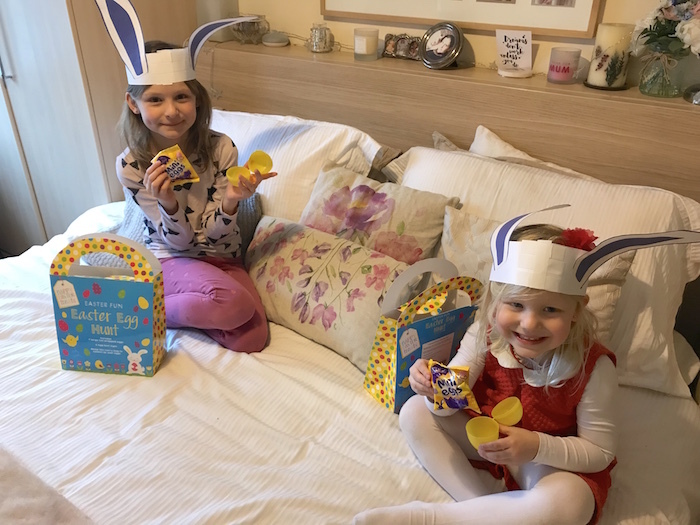 What do you think of Cadbury’s 2018 Easter range as well as the activities, guides and book provided on their website? *Disclaimer: This is a sponsorship with Cadbury. However, all thoughts and opinions are my own. I love that your girls were both so happy to share the main prize too, they’re such sweethearts! Sounds like an exciting egg hunt! Love the pics, Franca. Ah bless ’em. We have kind o0f had a non easter. I feel bad for not organising a hunt but it’s not ideal in my house. I need to up my game next year and maybe take G to a hunt at the local farm this year to make up for it. How lovely! I love the bunny ears, I would have wanted some too lol.